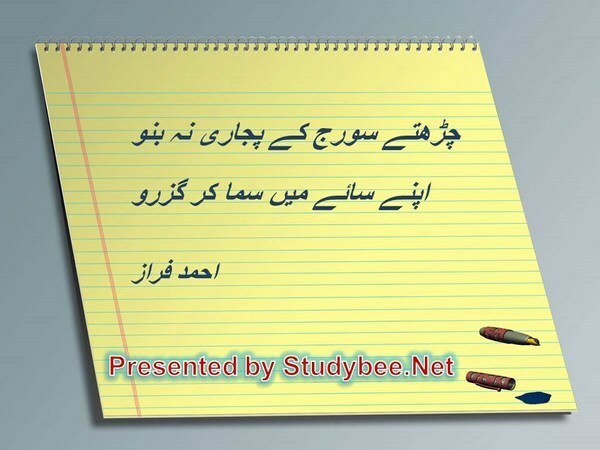 Ahmed Faraz Urdu Social Poetry: At studybee.net, we have hand picked all such verses from the poetry of Ahmed Faraz that have any relevance either to the prevailing or past social conditions and issues of Pakistan as well as of world Muslims. The verses are arranged in order of social poetry because we found some thematic relations of these individual verses, sometimes of complete poems, having strong relation to criticism over the static and non-progressive social order which does not change despite a wide spread of education and the evolution of new bourgeoisie class in our country. The social stalemate remains unchanged and the people keep suffering despite boasting of greater successes of every incoming government. We believe the society, overall as well as individuals, is responsible for the mass sufferings and injustices of the society.